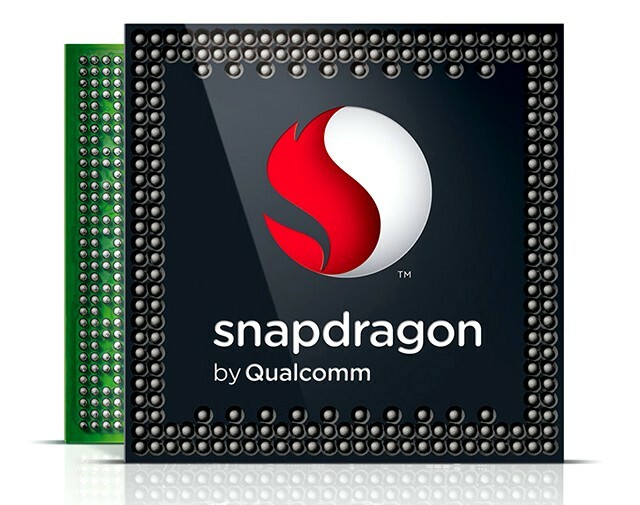 The Qualcomm Snapdragon 801 APQ8074AB is an ARM-based SoC for (mainly android) tablets. It is built at TSMC in a 28nm HPM (High Performance Mobile) HKMG process and includes 4 Krait 400 cores at up to 2.45 GHz and a Adreno 330 at up to 578 MHz. Furthermore, the SoC integrates a LPDDR3-1866 memory controller as well as WLAN 802.11ac, Bluetooth 4.0 and GPS (but no cellular modem). Compared to the Snapdragon 800 chips like the MSM8974AB, the 801 offers a higher clock rate for GPU and CPU and support for eMMC 5.0. The CPU portion is based on Qualcomm's Krait architecture, which is compatible with the ARMv7 ISA. Compared to the Snapdragon 600 (Krait 300), the new Krait 400 cores of the Snapdragon 801 have been tweaked just slightly with faster L2 cache. Thanks to a clock rate of up to 2.36 GHz and a high performance per MHz somewhere between an ARM Cortex-A9 and a Cortex-A15, the Snapdragon 801 offers very strong CPU performance. The S801 competes with the Nvidia Tegra 4, Samsung Exynos 5420 and Apple A7 and is therefore one of the fastest ARM SoCs on the market in the beginning of 2014 (till the Snapdragon 805 arrives). Another difference between the Snapdragon 600 and 800/801 is the graphics unit. While the S600 implements an Adreno 320 (400 to 450 MHz), the S800 and S801 features the faster Adreno 330 (APQ8074AB: 578 MHz). Both GPUs offer the same amount of texture units (8 TMUs), but the Adreno 330 has 50 percent more shaders (probably 6x SIMD16 vs. 4x SIMD16 of the previous generation). In conjunction with the higher memory bandwidth, the performance is significantly better. As a result, the Adreno 330 is slightly faster than the Mali-T628 (Exynos 5420) and comparable to the PowerVR G6430 (Apple A7). Depending on the device and cooling, however, the performance may vary. The GPU supports OpenGL ES 3.0 as well as OpenCL 1.2. Furthermore, the MSM8974AC supports the wireless technologies Bluetooth 4.0 as well as WLAN (IEEE 802.11a/b/g/n/ac 2.4/5 GHz). However, the APQ8074AB does not offer an integrated cellular modem. The Snapdragon 801 can encode and play UHD 4K videos in 3840x2160 at 30 FPS (120 Mbps H.264 High Profile) simultaneously via dedicated hardware. Moreover, it supports both USB 2.0 and 3.0 and cameras up to 55 megapixels and stereoscopic 3D. Thanks to the new 28nm HPM HKMG process, the energy efficiency has been improved significantly compared to its LP 28nm S600 predecessor. Depending on the field of application, the maximum power consumption should be about 4 W. This should be similar to comparable ARM SoCs currently in the market. However, the APQ8074AB will likely need a little more power than the slightly lower clocked MSM8974.